Gordon Cheung's second solo exhibition at Edel Assanti examines the relationship between civilisation and conquest. Espousing a bird's eye view of the present historical moment, Cheung maps our geopolitical landscape within the context of a broader human story, invoking a causal chain that dates back to the dawn of civilisation. The landscapes of Cheung's works are populated by references that are both generic and specific, apparitions of a digital age in which reality is experienced as much through technological mediation as first-hand. 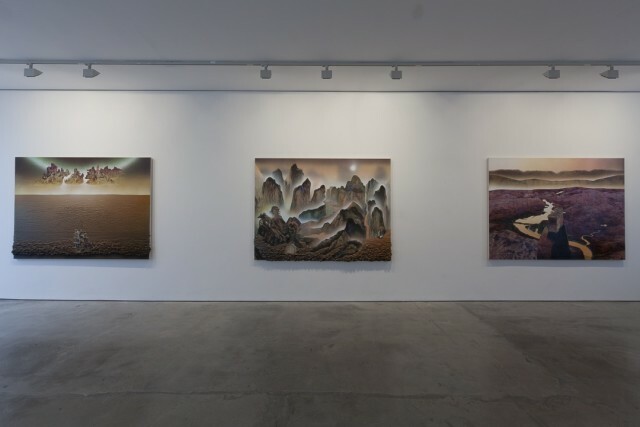 These paintings begin life as digital sketches, aggregating a mass of found internet imagery in a multilayered, simulated landscape resembling a toxic hyper-reality. Degenerative city scenes and noxious deserts, familiar from dystopic science fiction, here form the backdrop against which the drama of the rise and fall of empires is enacted. The coordinates of Cheung's paintings are firmly situated within current international power politics. We are confronted with varied scenes: an aerial view of Guantanamo Bay, a lingering spectre of ideological hypocrisy; seemingly anonymous factories (in fact belonging to the world's largest arms manufacturers); disputed island chains, seized by The People's Republic of China for strategic reasons; and Chinese "nail houses" - privately owned properties whose owners refuse to sell their land to the state, resulting in large scale urban development proceeding around isolated, often rural individual houses. The Abyss Stares Back meditates on the 21st century collective realisation that the western neoliberal model is in fact not, as posited by Francis Fukuyama at the end of the Cold War, "the end point of mankind's ideological evolution." However, the mythological prism through which Cheung processes subject matter compels us to view his case studies in the context of historical precedent - part of a recurring cycle in which every empire is destined to fall, to be replaced by another. Indeed, apparitions of Western decadence linger in the form of trophy heads and Dutch still life motifs; the former is employed as an allegory for conquest, the latter a recurring them in Cheung's practice, referencing the tulip bubble whose collapse brought an end to the Dutch Golden Age. Another ever-present device in the artist's oeuvre is that of "cartoon fear" - the notion of paranoiac fears pervaded by media, market, or state, metaphorically portrayed by Scooby-Doo ghosts in Cheung's paintings. The unsettling atmosphere of The Abyss Stares Back lies in its projection of these collective anxieties, alongside the insinuation that we represent a fleeting moment in, rather than the end of human history. In an ever- muddying landscape we are left to distil myth from truth, reality from hallucination. Cheung graduated Central Saint Martins in 1998, completing an MA in painting at the Royal College of Art in 2001. He was commissioned for a Laing Art Solo Award in 2007. Recent solo exhibitions include The Solar Cry at Edel Assanti (2012), Altered States at the Arizona State University Art Museum (2010), The Four Horsemen of the Apocalypse at the New Art Gallery Walsall (2009) and The Promised Land at Jack Shainman Gallery (2009). Cheung's work is currently included in Vita Vitale, The Azerbaijan Pavilion at the 56th Venice Biennale. In 2016, Cheung will have a solo exhibition at Nottingham Castle Museum. Cheung's works are included in major international private and public collections including MoMA, The British Museum, The Hirshhorn Museum and Sculpture Garden, San Antonio Museum of Art, The Whitworth Museum, Arizona State University Art Museum, Knoxville Museum, The New Art Gallery Walsall. Cheung lives and works in London.